¶ 5 Leave a comment on paragraph 5 0 According to Stacy William’s liner notes, Dylan learned Freight Train Blues from a Roy Acuff record . Stacy Williams was the pen name of New York Times critic and Dylan biographer Robert Shelton, who made a little spending cash writing liner notes for folk recordings. 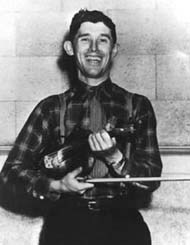 Acuff was a very popular country singer and a regular performer at the Grand Ole Opry. Another of Dylan’s early heroes, Hank Williams, also recorded it. ¶ 7 Leave a comment on paragraph 7 0 Dylan performs the song at a faster tempo and with greater exuberance than Acuff. He also shows off his yodeling talents and his falsetto voice. At one point he holds a note – according to a rec.music.dylan poster – for 14 seconds. Wow! ¶ 8 Leave a comment on paragraph 8 1 Dylan has never played the song live. ¶ 9 Leave a comment on paragraph 9 0 Lots of other people have. ¶ 12 Leave a comment on paragraph 12 0 A spirited version by Johnny Duncan from 1957. ¶ 14 Leave a comment on paragraph 14 0 June Carter’s sister. ¶ 16 Leave a comment on paragraph 16 0 The more popular blues song with the same title. Well, it looks like I’m never gonna lose the freight train blues. Oh Lord mama, I got them in the bottom of my rambling shoes. I have a live version of Freight Train Blues. You can purchase it on ITunes on the compilation Folk Barbecue Party. He also plays Stealin’ Stealin’.